Higher Venton Farm was once the home of the famous writer Beatrice Chase, who passed the farm onto our family in the 1950's. Most books on Dartmoor & certainly those wriiten about Widecombe will in some part mention Beatrice Chase, real name Olive Katherine Parr. After developing tuberculosis, she came to Widecombe, and quite simple stayed. Under her pen name, Beatrice soon started writing her short stories and other works of fiction. A lot of it based on the people and places of Dartmoor. 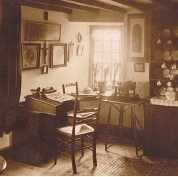 Through her books the British public were drawn to Dartmoor, to seek out the attractions for themselves, and of course to visit Venton - to see the Dartmoor window where she sat whilst writing most of her work. 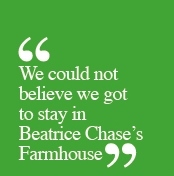 Nowadays there seems to be a great interest in Beatrice Chase and her books, every summer season we get guests staying with us so as they return home saying they have stayed where Beatrice Chase lived.